It's been a common refrain for years - artificial sweeteners make people hungrier and actually lead to weight gain, and just last week a new paper was thrown onto that fire. But what does the paper actually say? Not much really. 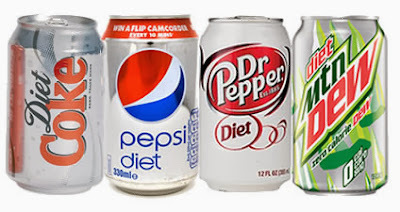 Just that the folks found to drink the most diet soda consumed the most calories. And that in itself probably isn't too surprising in that there's a strong likelihood that many who struggle with dietary choice and portions will choose diet beverages (perhaps as a means to compensate for solid calories, or perhaps as a means to unconsciously permit or excuse them, or perhaps those consuming sugared versions under report them as this paper (thanks @nutsci) suggests). As I've mentioned many times before, looking at all comers when it comes to the study of the impact of artificial sweeteners on weight management isn't the right way to do things. If you truly want to see if the use of artificial sweeteners is helpful or harmful to weight management you need to look at whether or not artificial sweeteners, when randomly assigned to study subjects involved in weight management efforts, were helpful or harmful. Helpfully, such studies have been done, and in every such study I've read, the zero-calorie beverage swaps have proven themselves to be beneficial. Ultimately the goal should be less sweet from all sources - sugar and sweeteners alike, but if you're actively trying to manage your weight, as far as the medical literature on diet soda to date goes, the lesser evil is still diet, just don't take drinking them as a license to not watch the rest of your meal.